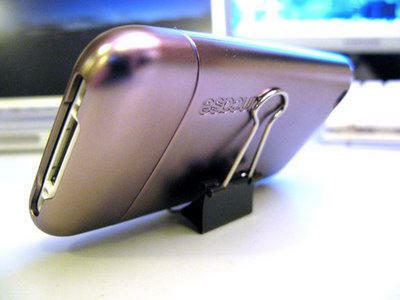 iPhone stands don’t get much simpler, or cheaper, than a standard binder clip. We like. How exactly does this work? I have a standard medium binder clip here in the office and the iPhone just slides right off. Is there some bending required? ot: what case is that? Good idea… using it right now with my N95. Just bend the one of the clip tips to almost 90 degrees. 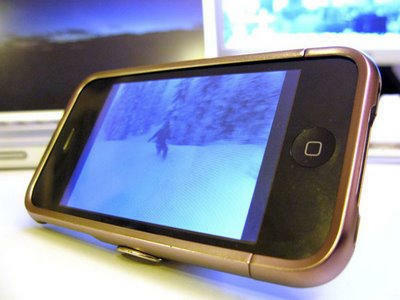 I just posted in my blog some picture of this using with my Nokia N95. Click my name to check it out. What kind of case is that on the iPhone? is that metal? This works pretty nifty. You do have to bend one end of the clip to make a J to hold the edge of your iPhone. For those who asked, that case is polyurethane. I have one made by Mobimax. That one looks like there’s Incase written on it (upside down).